This past Tuesday (May 31) I had the opportunity to present a 2-hour lecture/demo on "simple" lighting for the Seattle Photographic Society. Basically, it was about using one light, though we did expand to two lights near the end of the evening. 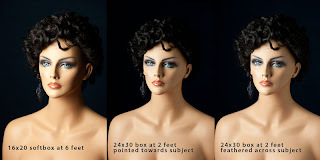 This blog post isn't meant to be a class on lighting, but contains some notes and concepts I wanted to reiterate for the folks who were in the audience that night. I started talking about quality of light in terms of hard or soft. The larger the light source, the softer the light. The closer the light source (which makes it larger in relation to the subject), the softer the light. The presentation started with an on-camera flash demo. In the image on the left side below you can see what this looks like. Relatively flat light with a hard shadow under the chin. I then took the flash off the camera (via a Canon Off Camera Shoe Cord 2) and held it off to the side to create the image on the right. The light size didn't change (small), so the shadows are still hard. Bu there are shadows now that give more shape/dimension to the subject. Instead of the flat face we now have a nicely shaped, thinner looking face. The next step was to put the flash back onto the camera, but I turned the flash head to the left and held a small (12") collapsible gold-color reflector out to the left for the light to bounce off of. The reflector became the light source on the subject, and although it was still about the same distance from the subject, it was many times larger than the bare flash head, providing a softer light that wrapped a bit around the subject as seen below. The lighting diagram below the image shows the setup. 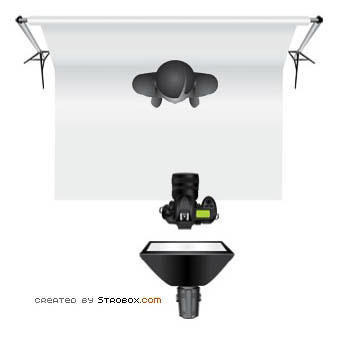 The next setup moved from flash to constant lights in softboxes. I tend to use flash for my own work, but for a demo like this I'll go to constant lights (equipment list at the bottom of this post) so that the audience can better see what is happening and they can come up and take photos with their own cameras without having to get synced up to the strobe(s). I started out showing what I think is a common mistake people new to studio lighting often make. I set up small softbox about 6 or 7 feet away from the subject. At that distance the softbox is a small light source, giving strong shadows. 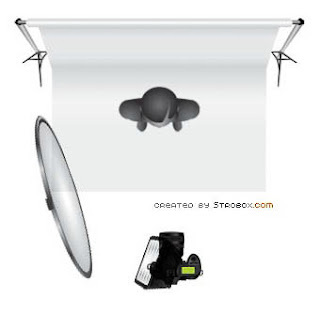 In the three images below you can see the small softbox image on the left. I think the shadows add to the image. And they are softer than the shadows seen in the direct flash photos in the first example above. 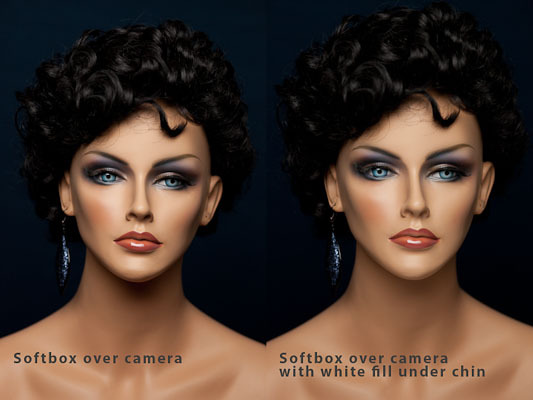 The other two images below show a larger softbox moved in closer. In the middle example the light is pointed at the subject. 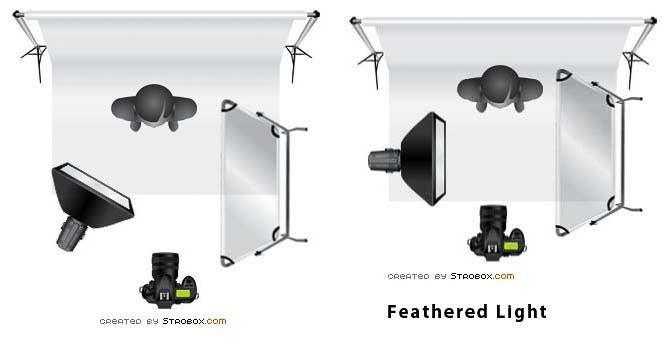 In the example on the right the light has been turned to point in front of the subject so it feathers across the face. The diagrams below show the light setup for the middle and right images. Another important concept that I wanted to show here with the lights at different distances is the effect on specular highlights. We are usually presented with a mix of diffuse and specular highlights. Diffuse highlights are basically all of the lit area of the image. They define the subject. 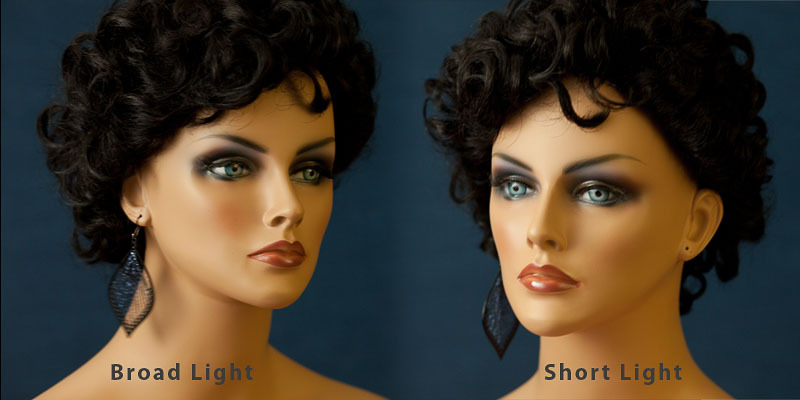 The effect of the light on diffuse highlights is that as the light gets closer, the subject gets brighter. As the light is moved away, the subject gets darker. See previous post on the Inverse Square Law. Specular highlights are mirror-like. They might be the reflection (catch light) in the subject's eyes, or the reflections from oils on the skin, or the reflection of the light on a cylindrical product shot. These highlights do not follow the inverse square law. As mirrors, they are always as bright as the original light source. So, when your light is far away from the subject it has to be much brighter than when close in to give the same exposure. When the light is further away, the specular highlights are brighter. As the light gets closer we can lower the light output causing the specular highlights to be diminished. The brightness can be controlled in a variety of ways. With constant lights you can stop down (stopping down the lens is usually the least desirable option because it changes the depth of field), change shutter speeds, or add diffusion or neutral density gels in front of the light. With flash the shutter speed won't matter, but you can use the gels, aperture, or you can turn the power down. Go ahead and read the preceding two paragraphs again. They cover an important concept that I don't see talked about often enough. For the next section of the presentation I moved the light to the front, directly over the camera and straight on to the subject. This is a classic beauty light position, sometimes called butterfly or paramount lighting. In the image on the left I just used the one light with no fill cards. On the right I added a white reflector under the subject's chin to soften the shadows. When working with a light in this position pay close attention to the eye sockets. If the light is too high for your subject the brows may cast a shadow, darkening the eyes. Lower the light to fix that. At this point, someone asked about eyeglass reflections. 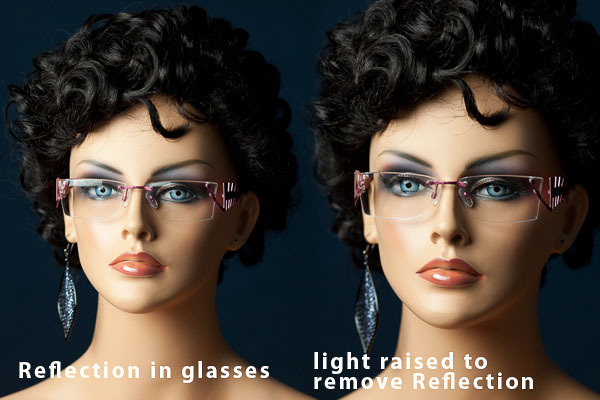 I put my glasses (which do not have an anti-glare coating) on the mannequin and moved the light slightly around to the camera's left, as shown in the left image below. You can see the reflections in the top of the glasses. In the image on the right I raised the light a couple of inches to remove the reflection. 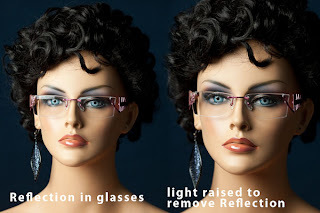 Another option, if raising the light caused unwanted shadows from the brow, would be to slightly tip the glasses forward, aiming them down, by lifting the arms of the frame off the subject's ears. We ended the section with a couple of quick demos to show short lighting vs broad lighting. Basically, if the subject's nose points towards the light, you have short lighting. 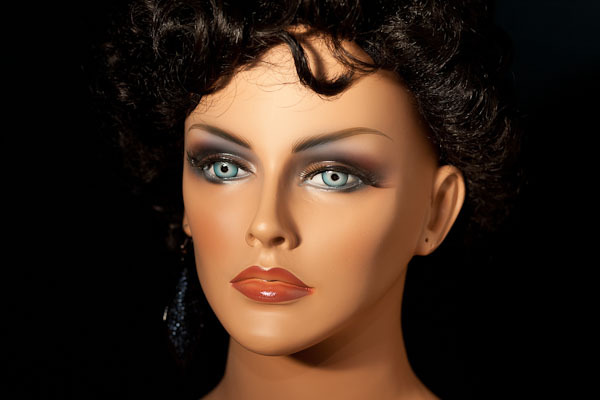 If the nose points away, you have broad lighting. Short lighting is the safe way to go for almost everyone. 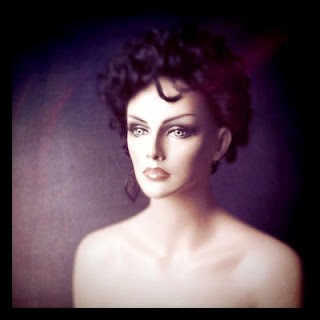 It narrows the face and gives good modeling. To quote Rolando Gomez instructing a model, "the lens is your friend and the light is your friend. Keep your nose pointing at either of them or between them and you will look great." Or, as Zack Arias says, "Eyes to the light!" And finally a quick demo of what a fast lens can do. These (below) are basically the same photo, but the one on the left is at f/4.0 and on the right is at f/1.8, with only the eyes in focus. 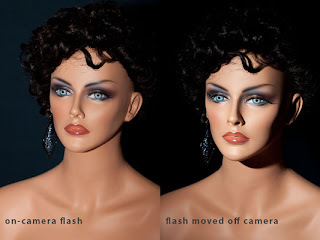 For the image on the right the camera was also raised slightly (making the eyes larger and the chin smaller) and moved in slightly (making the face appear narrower by making the ears appear to be further back). Again, this post isn't meant to be a lighting class. This is a refresher for those who were in the audience. I am available to present lighting classes. Email me for more information and rates for classes if interested. 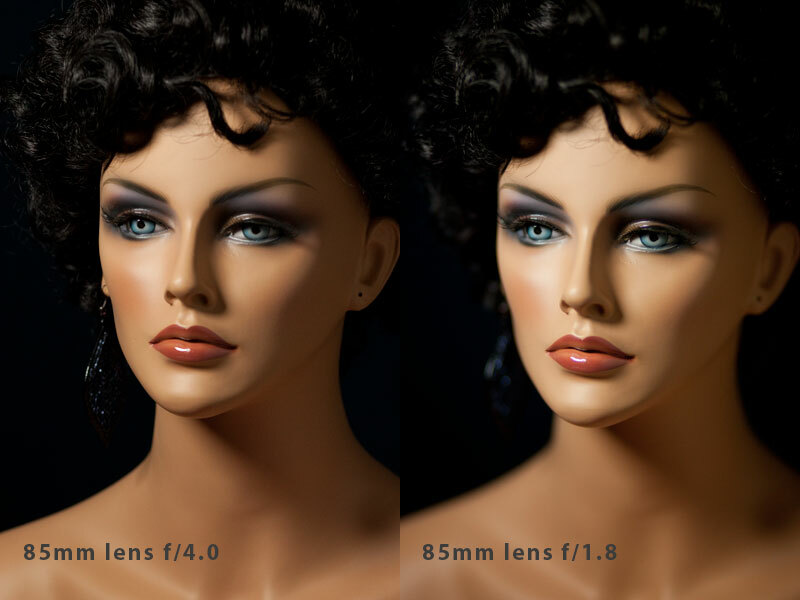 All images in this post were taken with a Canon 5DmkII with an 85mm f/1.8 lens. Most images were taken at f/4, except where noted. ISO was 800. Shutter speed varied. The flash photos used a Canon 550EX flash. The remaining images were lit with a Photoflex StarLite QL with a Coolstar 150 CFL (fluorescent) bulb in a SilverDome nxt medium softbox (available as a kit) and/or a WhiteDome softbox.